One of the citruses on the back garden path. They tend to need a lot of care to survive, let alone thrive. When I purchased the Convent, I also bought the vacant paddock next door with the hopes of turning it into an orchard/parkland. Well, the best laid plans… There’s been so much else to do that my attentions haven’t quite made it that far, although I can now mow it and have started mulching it in parts. 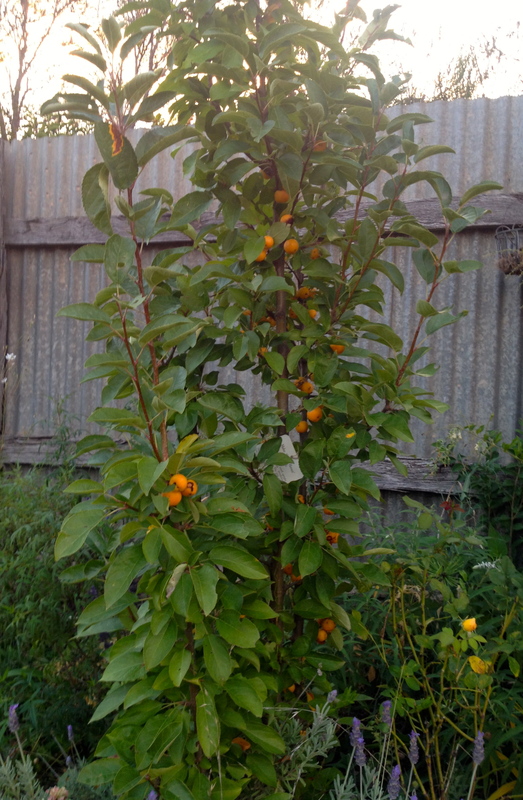 This peach tree is self sown and has made itself quite at home. In the meantime, I’ve done a quick inventory and was surprised by how many fruit trees have found their way into the Convent garden. I had originally planted a small grove of about half a dozen olive trees, which for the most part are happily and healthily growing. 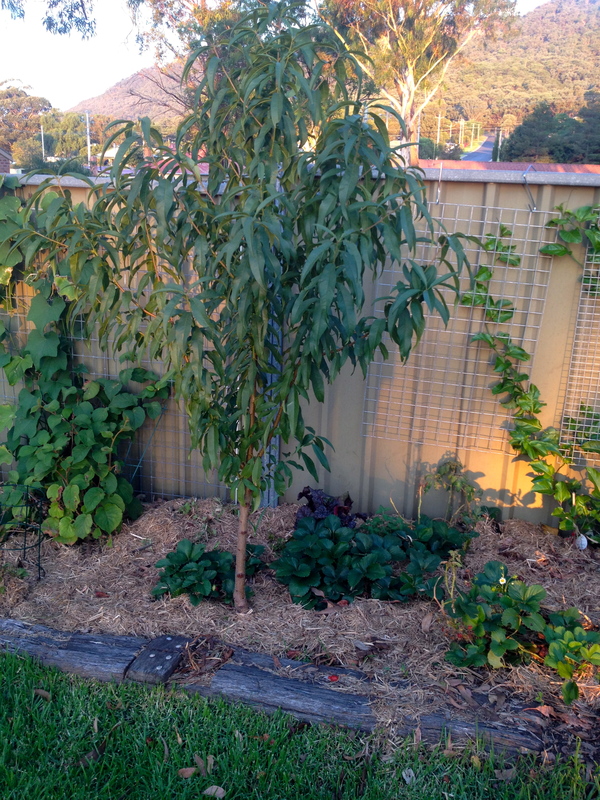 The side colorbond fence bed was mainly established out of compost, much of which was kitchen peelings directly thrown on the bed, so a few interesting things have emerged, including a self sown Peach which is looking just peachy. 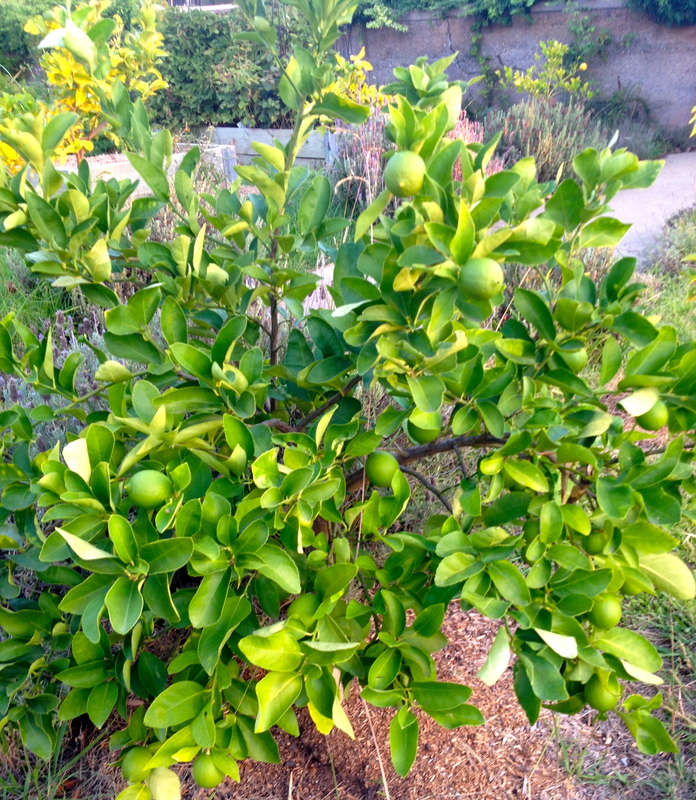 The citrus are well represented with the back garden path to the church being flanked by 4 limes and 4 lemons and there are a couple of Finger Limes, a Chinotto and a Kaffir Lime spread around the property. Some old fashioned plants have made themselves at home including a fruiting Quince, two Elderberries, a Damson Plum and a very old fashioned but absolutely lovely tree called a Medlar. 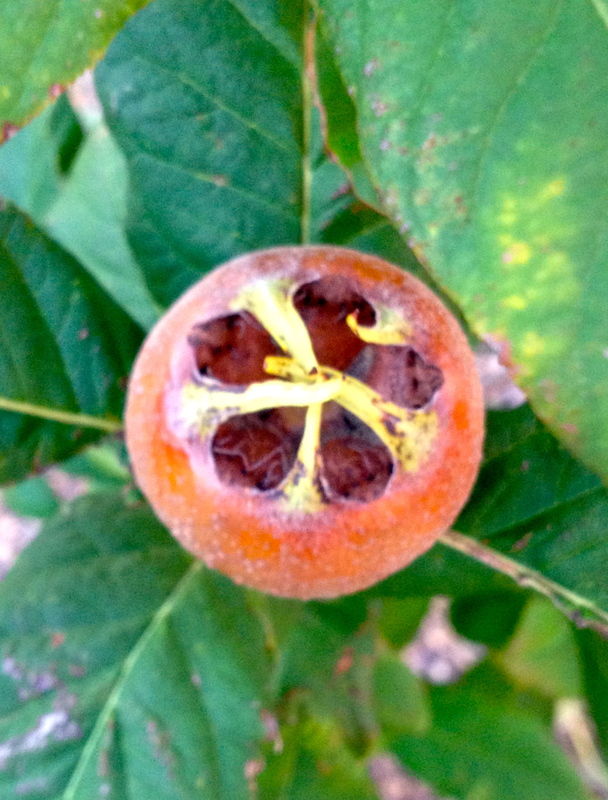 The Medlar – it has a nice shape and lovely green leaves. I love the leaves on the Medlar as well as the shape, and the blossoms are also quite lovely, however I’ve read that the fruit are somewhat unflatteringly called dog’s arse fruit. I leave that up to you to guess why. The fruit can be used in jams and jellies, however is treated quite differently to other fruits. It is picked but left to go ripe in cool shaded spaces. In fact it’s called “bletting” which is similar to letting it rot. I’ll be interested in trying this when I get a bit bigger crop. 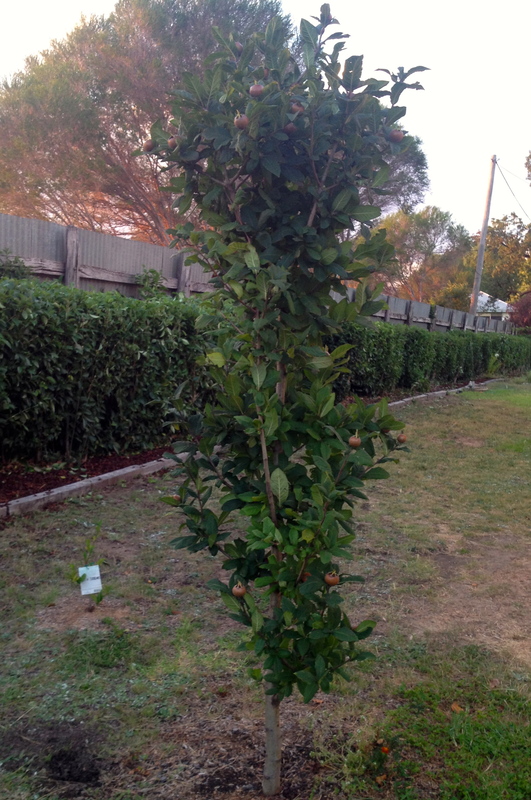 I also have a couple of crab apples which appear to like the area and seem pretty healthy. There’s a small fig that hasn’t really taken off and some Tea Camellias. Vines such as Passionfruit and Kiwi Fruit will add interest in seasons to come. These plants just need a bit of TLC to get them to the point where they will provide a harvest. In the meantime, I just enjoy watching them grow and become part of the garden. 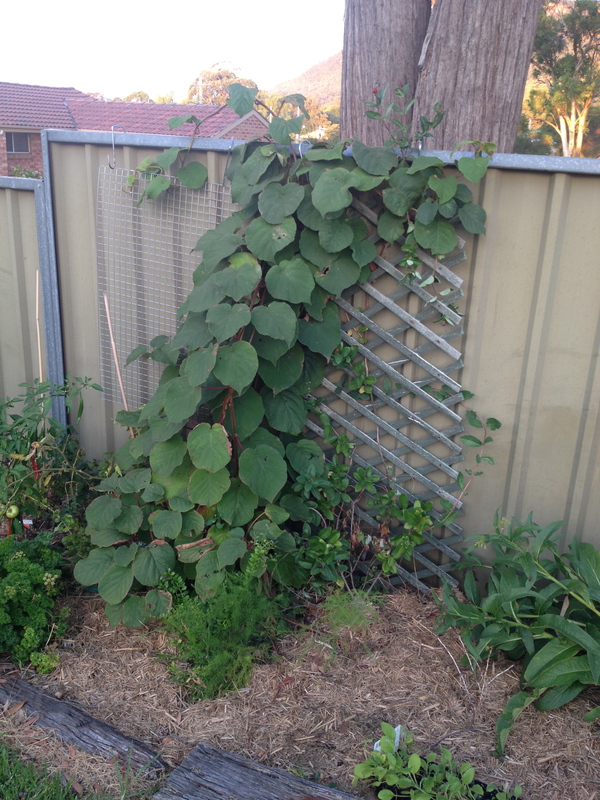 Kiwi Fruit starting to establish itself along the colorbond fence. You need a mate so there is another to keep it company. One of the Crab Apples – this time a Golden Harvest.